At HashiConf 2017, we announced Sentinel, a framework for treating policy as code. 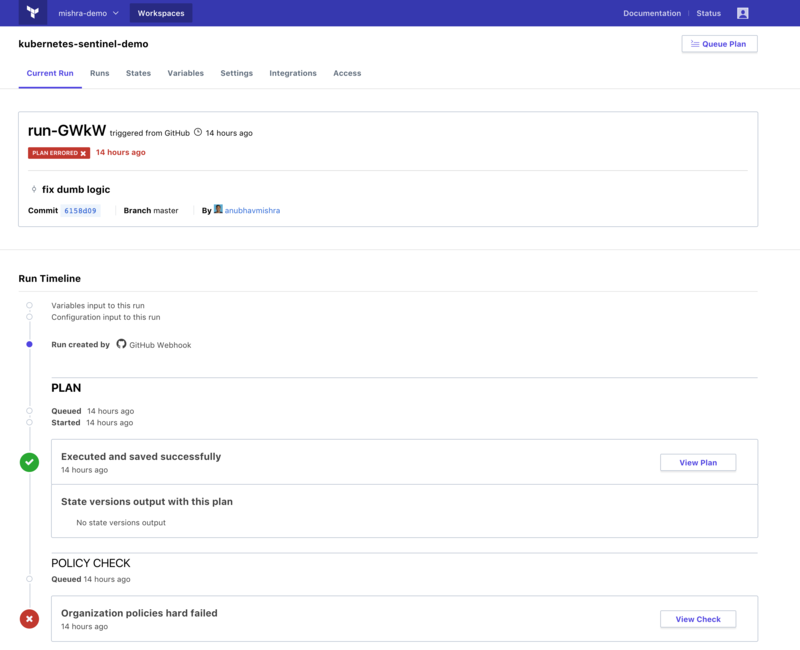 Sentinel is built-in to the HashiCorp Enterprise products to allow automation guardrails, business requirements, legal compliance, and other policies to be actively enforced by running systems in real-time. To learn more about how to use Sentinel in Terraform Enterprise, please read our previous blog post Sentinel and Terraform Enterprise. For an overview on the Kubernetes provider, please read our previous blog post Managing Kubernetes with Terraform. The above policy goes through all kubernetes services that are part of a Terraform plan and validates that they are of type NodePort or ClusterIP in order for the policy check to succeed. An operator can use enforcement modes to determine what happens if the policy was to fail. In this case, they might want to use “Soft mandatory” as it requires an operator with appropriate permissions to override any policy failures. This enforcement mode provides a great way to validate and gate keep services that are being requested by the users. Below is a screencast of this policy enforcement using Terraform Enterprise and Sentinel. The above policy helps keep the resource reservation in a Kubernetes cluster under control and helps prevent a situation where the newer workload isn’t schedulable on the cluster. Since this policy enforcement is so critical, an operator may want to use “Hard mandatory” policy enforcement that doesn’t allow any overrides on failures and the policy must pass before any changes are applied. Below is a screencast of this policy enforcement using Terraform Enterprise and Sentinel. 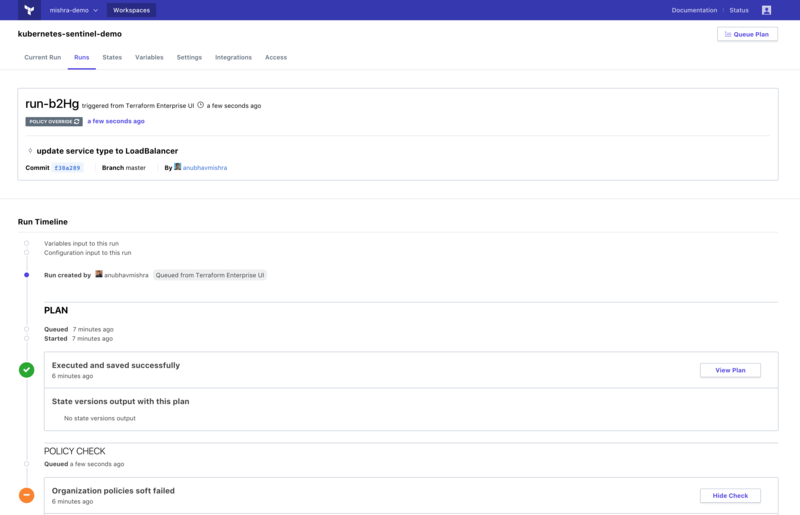 Feel free to fork the kubernetes-sentinel Github repository to your Github account and try out the examples that are covered in the post. » Why Use Sentinel with Kubernetes? Kubernetes provides a flexible platform to deploy and manage modern containerized applications. While access controls are supported to restrict who can use the cluster, fine grained policy is much more complex. When using Terraform to orchestrate Kubernetes, we get the benefits of infrastructure as code and a consistent workflow for provisioning infrastructure. On the other hand, Terraform Enterprise enables us to use Sentinel to enforce fine grained policies on top of any existing access controls. This lets us enforce security policies, operational best practices, and avoid compliance issues. Sentinel provides the tfplan plugin which has access to the Terraform plan. The plan simulates the effects of allowing the given changes. Hence the policy enforcement can take advantage of this simulated state created using a Terraform plan and validate policies on the applied state of a resource. Sentinel policy language is aimed to be simple. The language is easy to understand and doesn’t require formal knowledge of programming. Unlike admission hooks in Kubernetes, these policies don’t require you to write Golang code to enforce them. No modifications need to be made to the Kubernetes cluster either, since the enforcement is being done in Terraform Enterprise, prior to using the Kubernetes API. The Sentinel language makes it easy for policymakers to create and enforce policies on Kubernetes resources. Sentinel provides a way for organizations to enforce policies on Kubernetes resources in a way that is granular and provides the automation necessary to efficiently scale. This post discusses only two examples of Sentinel policies that can be used to enforce control over a few Kubernetes resources like services and replication controllers but this same Sentinel policy can be applied to many other resources that are supported by the Terraform Kubernetes provider. For those that are already using Terraform Enterprise, you can try the two examples shown in the post. To learn more and get started with Terraform Enterprise or request a free trial, visit https://www.hashicorp.com/products/terraform.